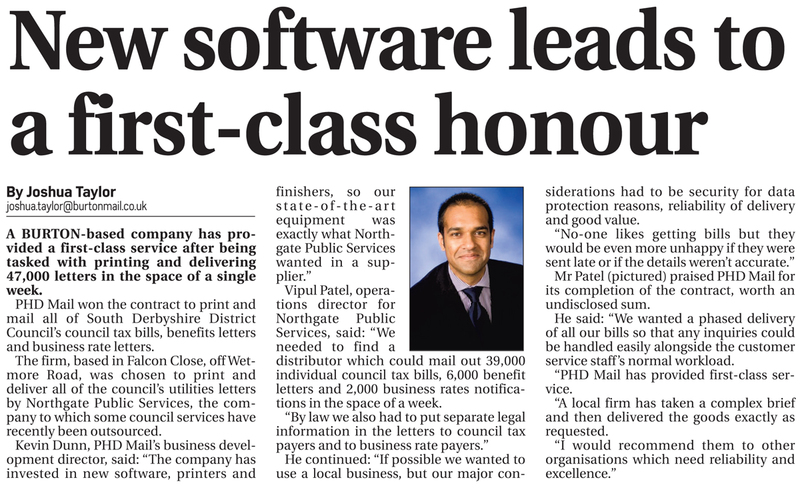 Northgate Public Services has chosen local Burton firm PHD Mail to support its partnership work with South Derbyshire District Council where the authority wants to cut costs not services. As part of its work for the Council, Northgate Public Services has taken over responsibility for sending out council tax bills. Northgate Public Services was able to find a local source with all the vital credentials in PHD Mail which is based at Falcon Close in Burton on Trent. As well as providing a trust-worthy and speedy service, PHD Mail followed the brief from Northgate Public Services exactly. Dave Shawley explained, “We wanted a phased delivery of all our bills so that any enquiries could be handled easily alongside the customer services staff’s normal workload.